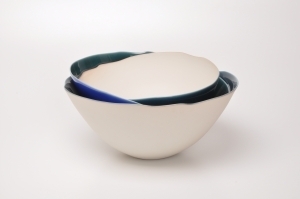 The purity of the white is enhanced by a palette of blue glazes and vibrant greens and fine and delicate waves formed by matter in a baking biscuit. This lead us into a world of fragile but serene balance. Their soft unglazed surfaces, their organic qualities, connect the works of FUKUMOTO Fuku to the “ephemere” events of the world, to the breaths of our universe. Curved shapes floating escape volumes, like visions of the Arctic Circle. Stylized flowers and exquisite base to emerge from a deep anchors. 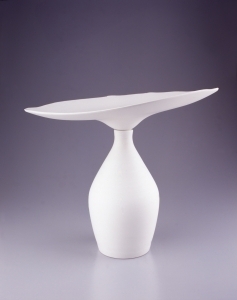 FUKUMOTO Fuku shapes the land and transcends it by transforming the traditional expressions of porcelain. The Japanese history of ceramics is transcended in the light of his Impressionist vision of nature.